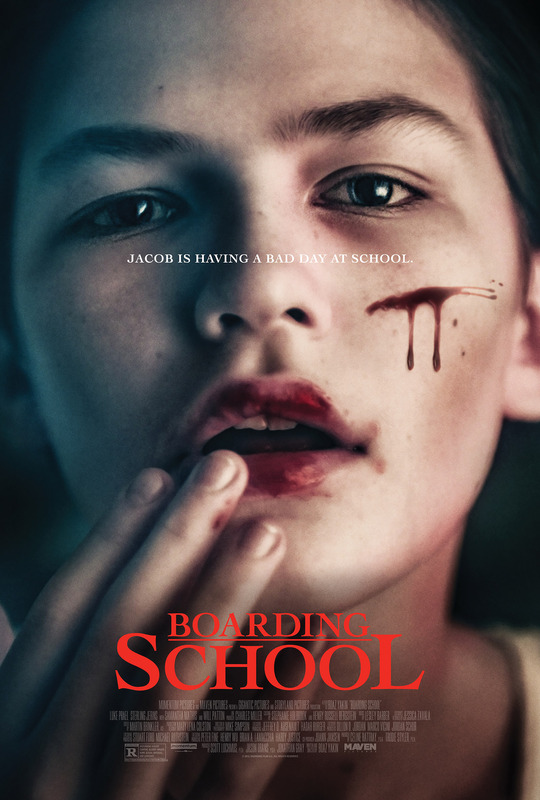 Home » Fight or Flight » Review: Does BOARDING SCHOOL make the grade? When troubled 12-year-old Jacob Felsen is sent away to boarding school, he enters every kid’s worst nightmare: A creepy old mansion deserted except for six other teenage misfits and two menacing and mysterious teachers. As events become increasingly horrific, Jacob must conquer his fears to find the strength to survive. Boarding School begins reminiscent of a wonderful book series Miss Peregrine’s Home For Peculiar Children (since made into a feature film in 2016). Unfortunately, it is nowhere near as interesting. We do not get to explore each student’s uniqueness or history to the fullest, we merely scratch the surface. This seems like it could have been the perfect opportunity to have a deeper emotional connection to the six kids the story should center around. What you are ultimately getting is a bit convoluted, with a hugely telegraphed moment during the rushed and, dare I say, spoonfed explanation of the film’s twist. The plot is also intertwined with a story of Jacob’s recently departed grandmother exacting revenge on her family’s Nazi tormentor during WWII. I wish we had seen more of these dream/memory moments. It would have played more cleanly juxtaposed with the climax of the film. While Boarding School fails to fully flesh out its characters, it does boast an outstanding performance from our young protagonist in Luke Prael, who can currently be seen in the smash indie hit Eighth Grade. His vulnerability and presence on screen is truly a sight to behold. I predict big things from him going forward. In the end, Boarding School had many lessons open for exploration (bullying, mental illness, gender identity) but doesn’t quite get a passing grade. Momentum Pictures released BOARDING SCHOOL in theaters and On Demand / Digital HD on August 31, 2018.